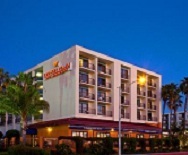 The Crowne Plaza Redondo Beach overlooks the King Harbor and the Pacific Ocean. The facility has ocean views from the recreation deck which features a heated pool, hot tub, saunas and a tennis court. Make sure that you book a room with a water view, as you can relax on your balcony and watch one of California’s majestic sunsets.